On this page we are going to post and reflect on the material (initially and principally photographs) we have ‘found’ in our trawls and investigations. This photograph by mókusom (via flickr) is a perfect example of the benefits and difficulties of such ‘found’ material. This image perfectly illustrates several of the issues that we have been dealing with on this blog and in our forthcoming paper for the Liminal Landscapes conference. The space of the promenade as instrument of the leisure industry, the role and function of the ‘tourist gaze’ (and issues of opticism more generally), the nature of the photograph as ‘sociogram’, and, most significantly, the regulation (by ‘the gaze’, norms and laws) of the spaces of ‘free time’ are all brought out here. This illustration is a great benefit but locating this image, the actual process of ‘finding’, is the source of difficulty. Flickr is an astonishing resource for the kinds of investigation we are engaged with but because it is an ‘open’ and user-catalogued archive there are no fixed means of interrogating the material of the archive. 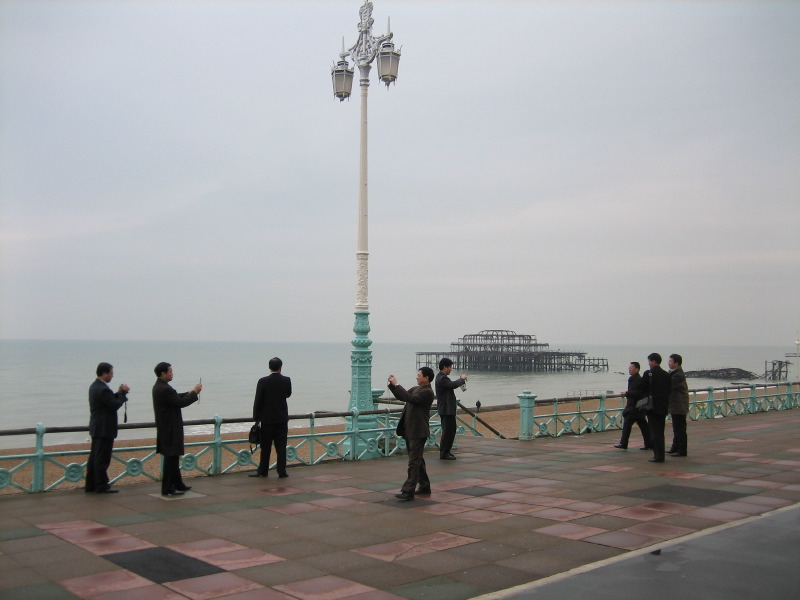 This particular images is titled ‘Brighton Promenade’ but is ‘tagged’ (i.e. keyword catalouged) with the terms ‘Brighton, beach, tourists, Suits’. The ad hoc character of this cataloguing process renders flickr a difficult source to extract useful (i.e. fit for our purposes) ethnographic material from.